Ad hoc means unstructured, inconsistent levels of performance. At the ad hoc level, tasks are not performed the same way by different people or different groups. For example, one system development group may use part of the system development methodology, but improvise other parts; another group may select different parts of the same system development methodology to use, and decide not to perform tasks done by a previous group. At this level, management manages people and jobs. Management will establish goals or objectives for individuals and teams, and manage to those objectives and goals with minimal concern about the means used to achieve the goals. This level is normally heavily schedule driven, and those that meet the schedules are rewarded. Since there are not standards against which to measure deliverables, people’s performance is often dependent upon their ability to convince management that the job they have done is excellent. This causes the environment to be very political. Both management and staff become more concerned with their personal agenda than with meeting their organization’s mission. The emphasis needed to move from Level 1 to Level 2 is discipline and control. The emphasis is on getting the work processes defined, training the people in the work processes, implementing sufficient controls to assure compliance to the work processes, and producing products that meet predefined standards. There are two major objectives to be achieved at Level 2. The first is to instill discipline in the culture of the information organization so that through the infrastructure, training, and leadership of management individuals will want to follow defined processes. The second objective is to reduce variability in the processes by defining them to a level that permits relatively constant outputs. At this level, processes are defined with minimal regard to skills needed to perform the process AND with minimal regard to the impact on other processes. At Level 2, the work processes are defined; management manages those processes, and uses validation and verification techniques to check compliance to work procedures and product standards. Having the results predefined through a set of standards enables management to measure people’s performance against meeting those standards. Education and training are an important component of Level 2, as is building an infrastructure that involves the entire staff in building and improving work processes. The emphasis that needs to be put into place to move to Level 3 is defining and building the information group’s core competencies. At this level, an information organization defines its core competencies and then builds an organization that is capable of performing those core competencies effectively and efficiently. The more common core competencies for an information services organization include system development, maintenance, testing, training, outsourcing, and operation. The information group must decide if it wants core competencies in fields such as communication, hardware and software selection, contracting, and so forth. Once the core competencies are determined, then the processes defined at Level 2 must be reengineered to drive the core competencies. In addition, the tasks are analyzed to determine what skills are needed to perform those processes. Next, a staff must be retrained, recruited, motivated, and supported to perform those core competencies in an effective and efficient manner. It is the integration of people and processes, coupled with managers with people management skills, which are needed to maintain and improve those core competencies. Lots of mentoring occurs at this level, with the more experienced people building skills in the less experienced. It is also a level that is truly customer focused – both the information organization and the customer know the information group’s core competencies. 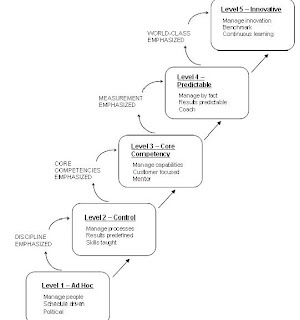 The managerial emphasis that is needed to move to Level 4 is quantitative measurement. Measurement is only a practical initiative when the processes are stabilized and focused on achieving management’s desired results. This level has two objectives. The first is to develop quantitative standards for the work processes based on performance of the Level 3 stabilized processes. The second objective is to provide management the dashboards and skill sets needed to manage quantitatively. The result is predictable work processes. Knowing the normal performance of a work process, management can easily identify problems through variation from the quantitative standards to address problems quickly to keep projects on schedule and budget. This level of predictability is one that uses measurement to manage as opposed to using measurement to evaluate individual performance. At this level, management can become coaches to help people address their day-to-day challenges in performing work processes in a predictable manner. Management recognizes that obstacles and problems are normal in professional activities, and through early identification and resolution, professional work processes can be as predictable as manufacturing work processes. The management emphasis that is needed to move to Level 5 is one of desiring to be world class. World-class means doing the best that is possible, given today’s technology. At Level 5, the information organization wants to be a true leader in the industry. At this level, the organization is looking to measure itself against the industry through benchmarking, and then define innovative ways to achieve higher levels of performance. Innovative approaches can be achieved through benchmarking other industries, applying new technology in an innovative way, reengineering the way work is done, and by constantly studying the literature and using experts to identify potential innovations. This level is one in which continuous learning occurs, both in individuals and the organization.